There's a lot of ways you can move yourself across the water -- by sailboat, kayak, jet ski, paddleboard, and surfboard, to name a few. Biking across the waves is a whole different experience, mixing the leg workout of a bike ride with the elevated views only an upright posture (like being on a paddleboard, minus the paddle) can provide. Three-wheeled water trikes have been around for a while: you've probably seen these Big Wheels on steroids at resorts. They're funny looking and amusing to play on, but pretty slow-going once they get in the water. The Schiller S1 water bike, on the other hand, slides along the water with the grace of an actual marine vessel -- they're basically a pedal-powered catamaran, minus the sail. "The S1 delivers a sensational bike ride on water that also comes with a glass bottom view of an aquatic world below," says Judah Schiller, CEO and founder of Schiller Bikes, who became the first person to bike across San Francisco Bay and the Hudson River in 2013. Schiller wedded cutting-edge nautical and bicycle engineering to create the S1, including a proprietary drive train, integrated handle bar steering, and rugged inflatable pontoons in a lightweight package. Sugar Beach offers lessons on how to use the bikes as well as rentals. 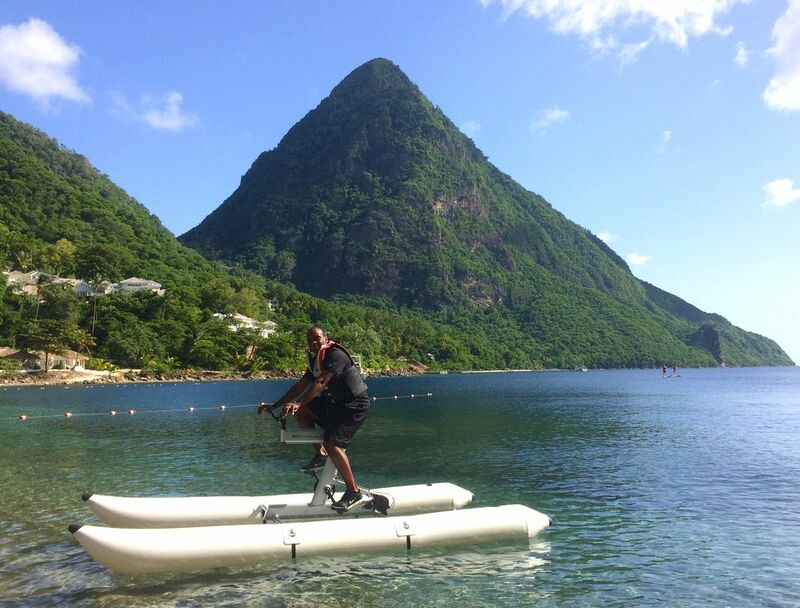 Rated safe on open water, the bikes can be used to explore Anse des Pitons, the body of water between St. Lucia's famous twin Piton mountains, right offshore of the resort. Backwards or forward, the Schiller is built for speed, powered by a propeller like a boat rather than giant wheels or paddles like some other water bikes. The handlebars determine the direction of the prop for steering -- no rudder required. The bike can only be used by one person by a time, but the rugged frame supports riders of up to 300 pounds. Besides the chance to ride a Schiller bike, the Viceroy Sugar Beach offers a variety of more traditional water sports activities, including windsurfing, sailing, kayaking, Hobie Cats, pedal boats (don't try to race the Schiller in these! ), snorkeling, and paddleboarding. Plus the resort has a fully certified PADI dive center, the gorgeous Rainforest Spa, and is located one one of the most beautiful beaches in the world, with luxury villas and bungalows offering nonstop views of the Pitons. A pair of lighted tennis courts top the list of the resort's land-based activities, which also include a daily schedule of fitness classes. When your day's activities are concluded, you can recap over an outstanding selection of fine rums at the resort's Cane Bay, one of the best upscale rum bars in the Caribbean.